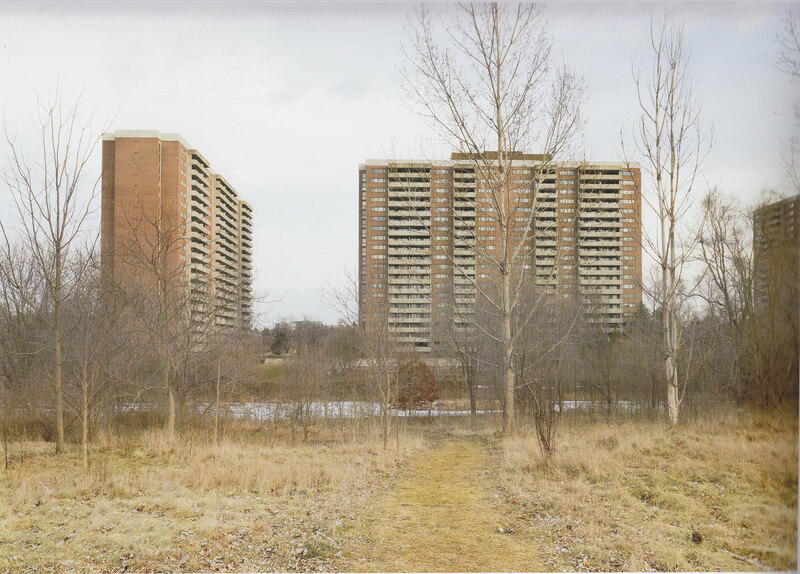 It has been nearly a year since I first saw Robert Burley’s magnificent photographs of Toronto’s ravine parks at the Aird Gallery, part of the Contact Photography Festival in May 2017. Burley somehow manages, through the compositional magic that gifted photographers all possess, to turn plain, everyday reality – roads, trees, people – into images of transcendent beauty. I have been loosely following his work for over thirty years, and it is always excellent, but this series struck me as particularly outstanding. 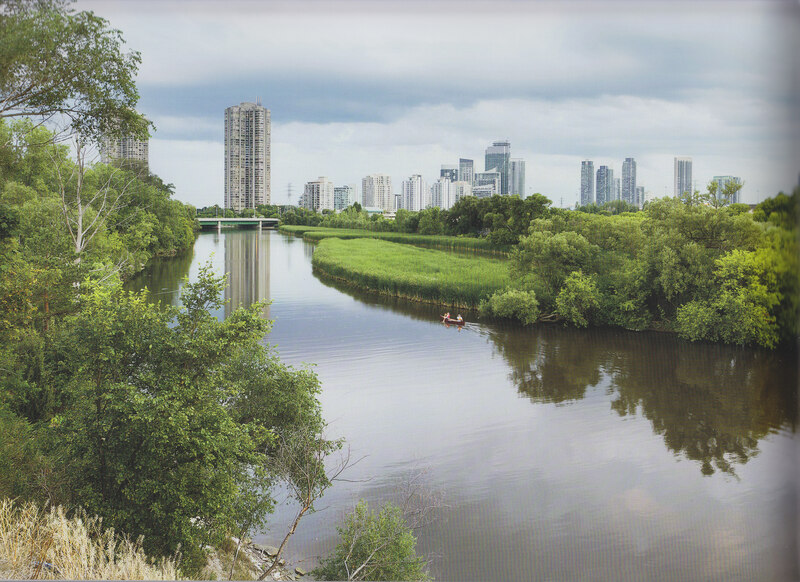 There is a hard-cover book accompanying the project as well, An Enduring Wilderness: Toronto’s Natural Parklands – a fine work on its own, with excellent reproductions of the photographs and several short pieces of writing by Toronto authors who have some connection to the parklands. Like many Torontonians, I know these ravines as an occasional walker of their paths. But I know them also as a planning historian. 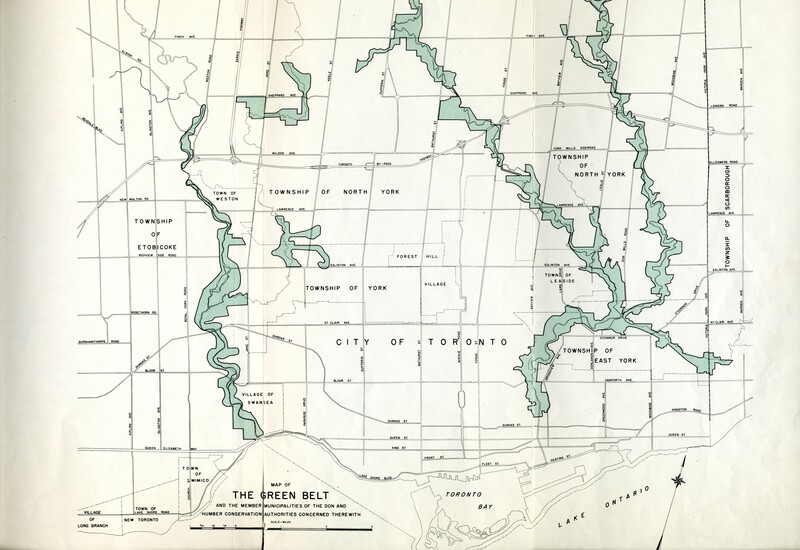 And these ravine parks are unmistakably the product of planning, having been conceived by Metropolitan Toronto planners in the 1950s as the city expanded out into its rural hinterland. Their planning pedigree has long been obscured by the ineradicable urban myth (thankfully, not repeated by Wayne Reeves in his essay in the book) that they exist on account of Hurricane Hazel, the storm that inundated the Toronto region with nearly a foot of rain over two days in October 1954, to devastating effect. The storm certainly expedited implementation of the parks plan. It prompted the local conservation authority to purchase much of the region’s flood-prone ravine land, forestalling any future development of it, and then to put most of this land – at least that which lay within the boundaries of Metropolitan Toronto – into the hands of the Parks Department for development into public parks. But the idea of ravines as public open space pre-dated Hazel. The planners’ vision was to develop these lands into a rather novel type of recreational space they labelled ‘metropolitan parks’ – larger than city parks but smaller than provincial parks. They would be like city parks in that they would be within the urban area, adjacent to residential neighbourhoods, and be served by public transit. But they would be unlike city parks in that they would be left in a natural state, with wilderness trails and natural picnic areas but minimal landscaping, no significant built structures, no playgrounds, and no playing fields for active games. Since they were meant to attract visitors from a fairly wide area, they would have ample parking lots, which most existing city parks, having been laid out several generations earlier, did not have. Maybe this vision was fanciful from the start – can city and non-city reside is such proximity? – or perhaps it worked at first but no longer does, the ravines having been debased by decades of human endeavour around them. But the truth is that Toronto ravines are not wilderness. One cannot literally get lost in them, at least not for long – notwithstanding Mr Burley’s charming anecdote in his introduction – for one need only look up and see the viaduct to get one’s bearings. That is not to say they lack value as public space. Their distinctive semi-natural quality – not entirely inappropriate for an urban park – gives them plenty of charm and appeal. There is, admittedly, plenty of pure nature in his images, from the simple, elegant “View of Lake Ontario from Cudia Park” to the rich, complex “Black Locust among Sumacs, Sylvan Park”. But those of us who have stood in locations such as these might recall, if we cast our thoughts back, the exposed culvert of an altered watercourse just out of view, the rumbling traffic on a bridge overhead, or the faint but pervasive odour of a not-too-distant sewage plant. This is an in-between landscape, somewhere between pristine and disfigured, perhaps even, as Leanne Betasamosake Simpson portrays it in “Life By Water”, a landscape of nature degraded, a tamed, almost lifeless wilderness. What then of the special, almost spiritual significance they are supposed to have in Toronto life? In the oft-repeated words of Robert Fulford “the ravines are to Toronto what canals are to Venice and hills are to San Francisco”. This has always struck me as a bizarre, rather boosterish claim that is hard to take seriously. Do tourists come to visit the Vale of Avoca? Has Morningside Park been the foundation for centuries of commerce and industry? In her book Imagining Toronto Amy Lavender Harris does show that, over the years, writers of Toronto-set fiction have used ravines as metaphors for mystery, danger, or escape – interesting, and understandable, since they are a distinctive feature of Toronto’s physical geography. But whether this makes them, citing Fulford again, “the heart of the city’s emotional geography” is another matter. Do Torontonians love and flock to them? Not that I can see. In my neighourhood’s local ravine on a pleasant Sunday morning I might pass in total a dozen walkers, nearly all of them with dogs, but none of my immediate neighbours ever seem to walk there and none has ever spoken of it. I cannot imagine any of them making a deliberate excursion to a larger ravine park, as the planners of the 1950s imagined we would do. And whenever I do I usually find the parking lots barely half-occupied and the nature trails lightly used. Burley’s compositions often include people – walkers and runners, paddlers and fishers, stone-skippers and beach-combers – but mostly in threes and fours. 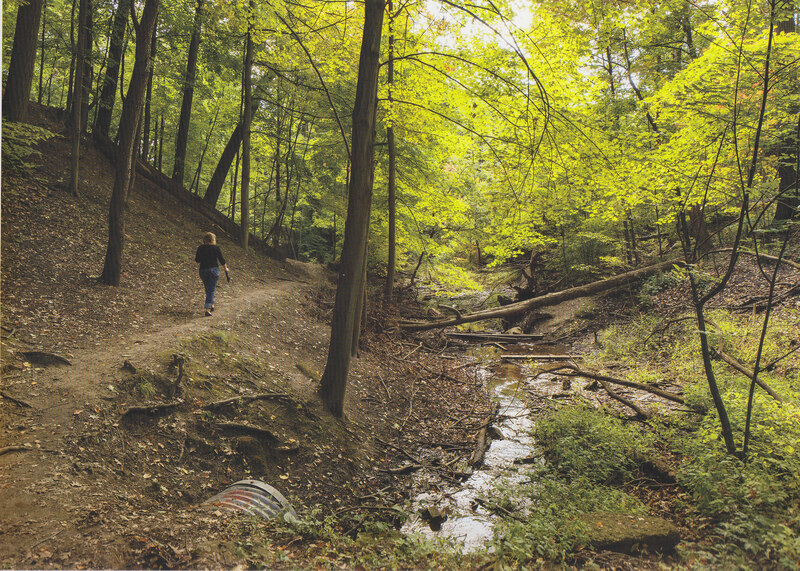 As the heart and soul of a city of nearly three million, Toronto’s ravine parks, all told, are curiously under-populated. Contrast this with conventional surface parks – think chock-full Trinity Bellwoods on a summer day – and reflect on the fact that the City, facing a shortage of inner-city parkland, is seriously considering spending nearly $2 billion to build a new park on a huge deck atop the lakefront rail corridor. All the while the ravine parks remain little used. As much as I enjoy the ravines’ curious in-between landscape, and as much as I swoon over Robert Burley’s photographs of it, I wonder if these ravine parks are truly serving the public. I begin to think that the planners’ notion of ravines as natural, un-developed, un-landscaped public open spaces woven into the urban fabric, appealing as it was in the parsimonious 1950s and sacred though it may be in the environmentalist present, has not aged well. And then my mind fills with heretical thoughts: some public authority taking inspiration from the fearlessly interventionist landscape designers of the mid-nineteenth century (think Olmsted’s splendid Delaware Park in Buffalo), admitting the truth about the impact of human activity on these ravines, and bringing in landscape designers and bulldozers to create beautiful public spaces that the public can and will use and enjoy. Who Designed St Lawrence Neighbourhood? It’s Jane’s Walk time again in Toronto, and thousands will be out this weekend on walking tours of various urban locales under the guidance of expert tour leaders. It is a remarkable success story, this concept, and a fitting legacy for someone who conceived one of the most influential books of the twentieth century on the basis of what she observed walking about the city. Among the options this year is a tour led by recently-elected Liberal Member of Parliament Adam Vaughan titled “Lessons from a Great Neighbourhood”. It begins in the celebrated St Lawrence Neighbourhood south-east of downtown, an area which was, the promotional blurb tells us, “built in the 1970s by some of our City’s greatest visionaries including Jane Jacobs”. This assertion will prompt an eye-roll among those of us who know otherwise, an eye-roll we have done before. 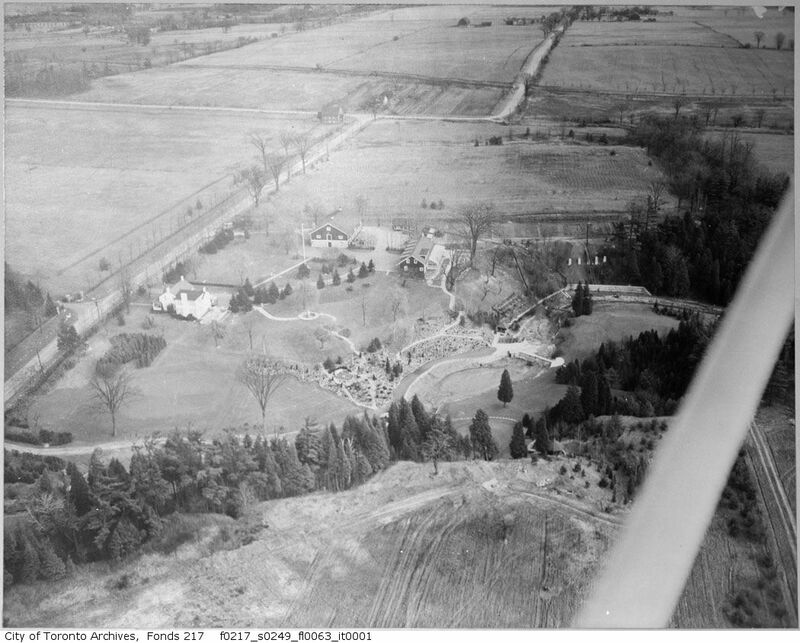 Jane Jacobs did not build St Lawrence Neighbourhood anymore than Clarence Stein laid out Don Mills or Frank Lloyd Wright designed my suburban childhood home. But who, then, did design St Lawrence? Determining who created the look and feel of an urban neighbourhood is no simple task. We know the designers of buildings, the high profile ones at least – Mies van der Rohe did the T-D Centre, and Daniel Liebeskind the new ROM addition – and even some less iconic ones like the Metro Reference Library (Raymond Moriyama) or Sick Children’s Hospital (Eb Zeidler). But trying to identify who created, say, Parliament Street in Cabbagetown, or even a more defined place like the core of Yorkville, is nearly impossible. This inscrutability, of course, flows directly from the fact that urban landscapes are an expression of the many interests, tastes, and laws that prevailed at the time of their creation – which is, in turn, why landscapes are such telling historical sources.